A day of moving with energy, getting in touch with our inner stillness, various types of meditation including breathing, visualising, sound and colour. This one day workshop is perfect for anyone interested in moving and still meditation. It will be a fun and relaxing day. 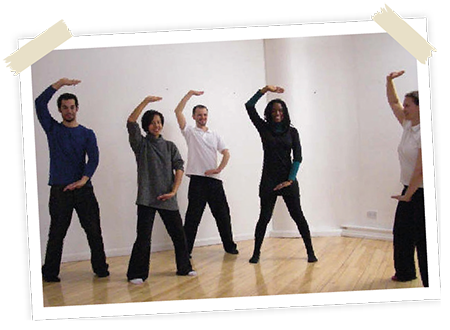 Also known as Qigong which literally means ‘energy work’, it’s a combination of various exercises or forms that help to cultivate and increase the body’s flow of Chi (vital energy). It is part of Traditional Chinese Medicine and has been around for thousands of years. As such, Chi Kung uses the same concept of the meridian system as acupuncture and shiatsu. These are said to be channels through which subtle energy flows. Chi Kung forms are practised standing, moving, sitting and lying down, and they are easy to learn and practise. The aim is to develop and mobilise Chi in order to achieve balance and good health on all levels. Many people report feeling calmer, less stressed, physically stronger, having increased levels of energy and a greater sense of wellbeing.